My job is not customer facing so I typically dress in business casual attire. My inclination is to go for a classic but still interesting look by pairing a red skirt with a plaid button-down shirt. I received this skirt c/o ShopVelvet but you can find a cotton skirt anywhere for under $50.00. This plaid shirt is one of my favorites from Old Navy. I got it last month for under $10.00 (see the pink version here). Of course, I can’t rave enough about these Merona Milena suede wedges. Overall, this outfit is well under $100. A year ago, I thought red was too loud for me. Now, I feel more confident wearing red. Incorporating one bright piece into your outfit (as long as you keep everything else neutral) will certainly boost your confident. I hope you enjoy this outfit. If you’re unfamiliar with the Petite Fashion Challenge, please visit this thread. Thanks, Annie for hosting this month's challenge. Don't forget to visit her blog to see the rest of the entries. P.S: Tomorrow is the last day to enter my giveaway for a chance to win a beautiful necklace. Great outfit, Sydney! I love the interest and color you added with the bright red skirt. Love the colors in your look! What a great, unexpected combo! Extra points for creativity! Amazing outfit, Sydney. The skirt definitely pops. I want a plaid shirt and red skirt just like that! You re-affirmed that I NEED those items in my closet, haha! Great styling! Red and plaid!...Beyond stylish! <3 it! Great look - the large gingham print + the red skirt look so fresh together! Wonderful job on the challenge. 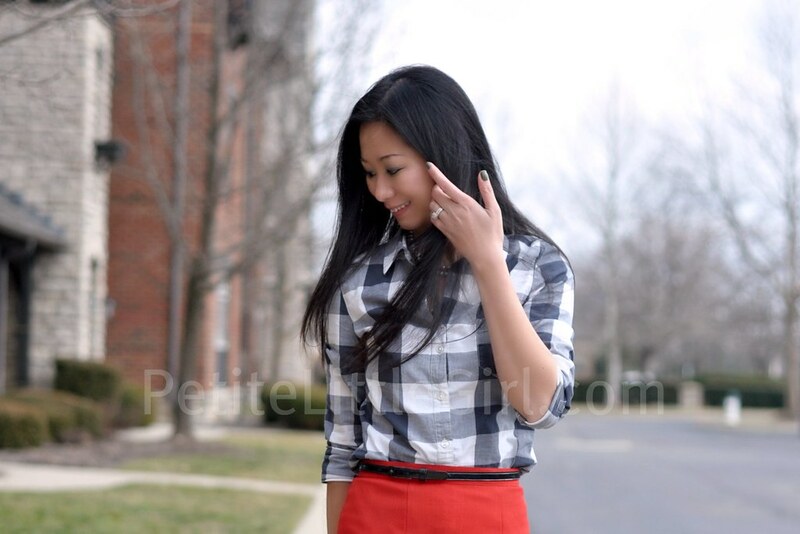 The red skirt looks good paired with the gingham. This is really great work look! Love the bright red paired with the navy gingham, very chic! I love that skirt! Great job on the challenge. I saw your blog. It is great. I am very interested to buy XXS (00P) size clothes. Do you sale any of these clothes showing on your blog? If so, please send me some pictures with the price. I prefer to see shoes, skrits, pants, and business casual appeals. New or Used are good for me. Pretty! Red punches up the most graphic ensembles...great mix! Syd, I have a secret. I was *this* close to putting together the same outfit you're wearing, swapping out the red pencil skirt for a black one. Great minds think alike? ;) Lovely outfit! I feel the same way about any pop of color. I wasn't comfortable with wearing brights unless it was blues or greens. I am trying to expand my horizons in a way. Red is such a great color on you, Sydney. love the fit too.